NUSIM, S.A. has supplied a compact biologic purifying plant for the José Cabrera N.P.P. decommissioning project. This project is developed by ENRESA at Almonacid de Zorita (Guadalajara). The origin and activity of the liquid radioactive waste is evolving during the decommissioning project, in accordance with the development of the works. So the waste treatment system shall adapt in order to remove the waste and interferences so the decommissioning works go forward. The final configuration of the liquid waste treatment system for this last phase of decommissioning implies the dismantling of evaporator and the installation of a filtrating and purifying modular system in order to treat those liquids generated in controlled area. 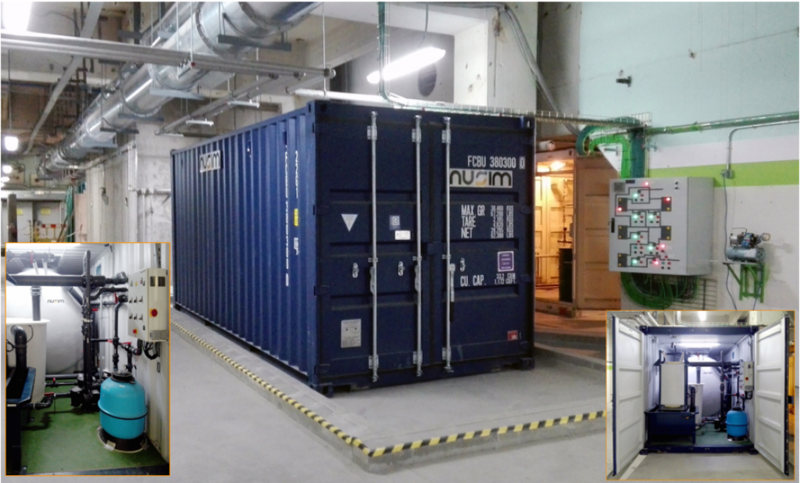 Apart from having supplied the compact biologic purifying plant, NUSIM has cooperate in the commissioning and start-up of the water radiologic treatment modular plant. This plant was also supplied by NUSIM 20 years ago for Vandellós 1 N.P.P. decommissioning. At the compact biological purifying plant NUSBIO, the wash water from laundry services will be treated in a biological reactor where the purifying of organic biodegradable materials is carried out by absorption and synthesis by active sludge. The mixture of water, sludge and oxygen is transferred to the decanter, where the secondary decantation segregate the purification sludges from the clarified water. This water is pumped to the radiologic treatment plant where the purified liquid waste will go through a pre filter, filter and resins demineralizers in order to remove the radiologic contamination.